Re-organizing some old gaming stuff (i.e. moving from one closet to another). 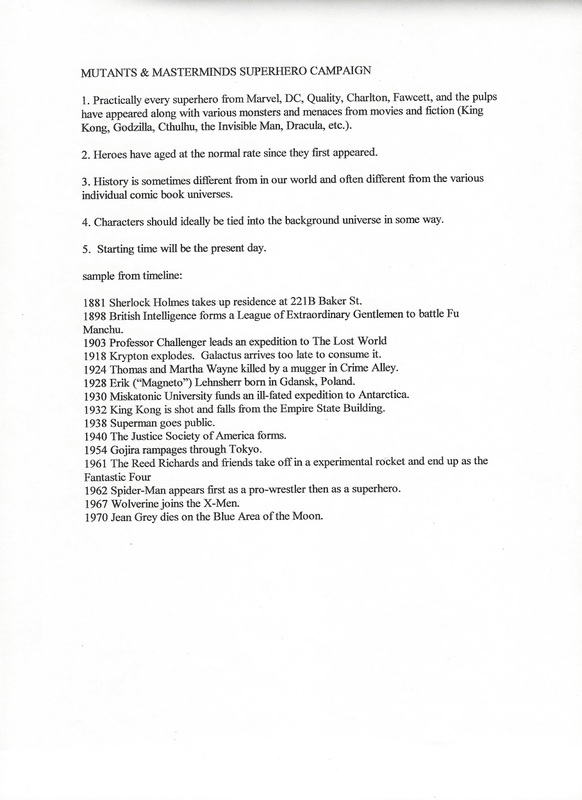 I came across a campaign intro document for a Mutants & Masterminds game I ran maybe 10 years ago. 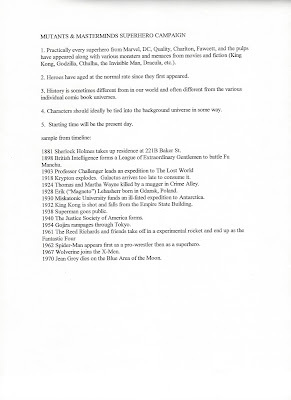 The idea was a universe where characters from virtually every comic book publisher existed in the same world and there was no "sliding timescale," so characters than first appeared in the 60s for example were in that era. 1. Batman still appears young and healthy 50 years after his first appearance, because every decade or so someone (usually a Robin) inherits the identity and equipment. 2. In 1980 (? -- matched the publishing year of the Marvel version of this story) Dark Phoenix kills the elderly Superman during her rampage on Earth. OMG, Galactus trying to eat Krypton is brilliant! Wish we'd thought of that. I like that a lot of these heroes are going to be VERY OLD, and probably ready to be put out to pasture (if not actually retired). Or course, many of the great antagonists from the comic history would be equally aged...though I suppose they could have "villainous proteges" as well. Were the PCs in your game given (or allowed) ties/relationships with various comic characters? Or were they simply a batch of "new generation" types? I encouraged the players to come up with connections to older characters, but most didn't. If it had been a group more steeped in comics lore, maybe they would have chosen to do so.